The other article that impressed me from the latest Journal of Book of Mormon Studies, 16/2 (2007), was Donald W. Parry’s “Service and Temple in King Benjamin’s Speech.” Why did it impress me? Because it related subjects in the Book of Mormon to the temple, something that we haven’t seen a lot of yet, but is becoming more common in recent days. Some of our detractors like to criticize the fact that the Book of Mormon appears to have little content related to the temple, while on the other hand the Church emphasizes the importance of the temple and the ordinances that occur therein. It is articles such as this one in the JBMS that clearly show otherwise. The temple plays a central role in the gospel, even in the text of the Book of Mormon, but we must be willing to look for it, and search a little deeper. I can attest that once you have this focus, the temple appears everywhere in this book of scripture as it does in all scripture. In his article Dr. Parry writes of many allusions to the temple in the setting of and the address of King Benjamin’s speech, mostly from Mosiah 2. 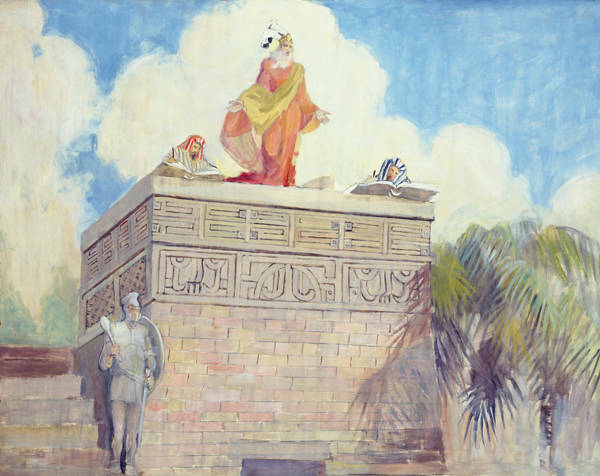 The most direct and obvious connection is that King Benjamin gave the address from a tower which was built just in front of the temple in the city of Zarahemla (Mosiah 2:7). The people came in a “sacred pilgrimage to a holy sanctuary—ascending or going up to a holy place”1. The temple is mentioned five times in the first seven verses of the chapter. Such repetition gives the temple a dominant place and emphasis in this text, one that we might not casually see. The people literally gathered “round about the temple” and faced their tents “towards the temple” to hear the words of King Benjamin (Mosiah 2:6). The symbolism here could not be more clear—the people were coming to the temple to be taught from on High. The temple is a source and place of learning, but only a singular type of learning happens here—it is the teaching from God. This article is an excellent example of looking deeper into the text of the Book of Mormon and seeing things that we might easily pass over in casual reading. Indeed, here we see the temple, and the sacrifices and offerings to God performed within, as prominent as ever. There are some prominent “temple texts” in the Book of Mormon. Other than King Benjamin’s speech there is Jacob’s speech at the temple which beautifully talks about the temple doctrine of broken hearts becoming pure hearts by “feasting upon his love” (Jacob 3: 1–3). The people of Gideon clearly had temple doctrine and liturgy taught to them by Alma. The key words are “enter into a covenant”, “paths of righteousness”, “one eternal round”, “unholy temples”, “the holy order of God”, “patience,temperate, diligent”, “faith, hope, charity”, “abound in good works”, “garments spotless”, “to go no more out”, and “peace of God rest upon you” (see Alma 7: 15–27). The key verse is Alma 8:1, Alma having taught the people of Gideon “many things which cannot be written”. Christ’s temple sermon on the mount in 3rd Nephi clearly teaches the major covenants of the current endowment. One of my favorite temple verses in the Book of Mormon is Ether 12:32. Excellent examples Mark! Thank you for sharing them. I have found many such connections to the temple in the Book of Mormon, even if it is just a word here or there. We’ll try to share those on this blog as we come upon them. Great blog – I just found it a few months ago and am working through it slowly (hence my long-delayed comment). Something that you didn’t mention here, but is significant is that the people came and pitched tents, much like what would take place in Jerusalem at the Feast of Tabernacles. I forget where I got this idea, likely from some reading of some LDS scholar. It seems to be supported by Mosiah 1:10 in which Mosiah is instructed to gather all the people together tomorrow. We don’t know how many people gathered, but it was enough that they all couldn’t hear. Gathering that many people to Zarahemla in one day might have been difficult, and so it may be that the people were already gathered for a feast and only needed to be told that King Benjamin was going to speak to them. Of course, this reads a number of things into the text that aren’t there, but it seems plausible. One thing I love about King Benjamin’s sermon is that from the very beginning, King Benjamin had the intention of giving his people a name to distinguish them, and one that would never be blotted out except by transgression (Mosiah 1:11–12). Also, this event would be a coronation of a new king. Some interesting parallels.